NEW VIDEO!!! It’s Apricot season and this Chicken is AMAZING!! Super easy and so delicious, this is the perfect solution for dinner tonight! I know that for lots of the country, turning your oven in on is probably not sounding that awesome right now? But this might be worth it. Especially since you can leave this particular dish in the oven for a loooong time, and therefore not be in the direct vicinity while it’s cooking. I like to go outside and do exciting things like deadhead flowers or go to the cold basement and fold laundary. Glamorous, no? Whatever it is that you do or don’t do, this chicken will be worth it. The sweet and tart of of the apricots and the spicy Dijon make this chicken totally irresistible. Pia turned her nose up at it whole heartedly when I was preparing it, but as soon as the smell of that sweet roast chicken hit her, she came running to the kitchen to drool over the scent and the browning bird in the oven. It turned out incredibly juicy and flavorful and when served with the roasted red onions and apricots it was a perfect mouthful every time. Enjoy! 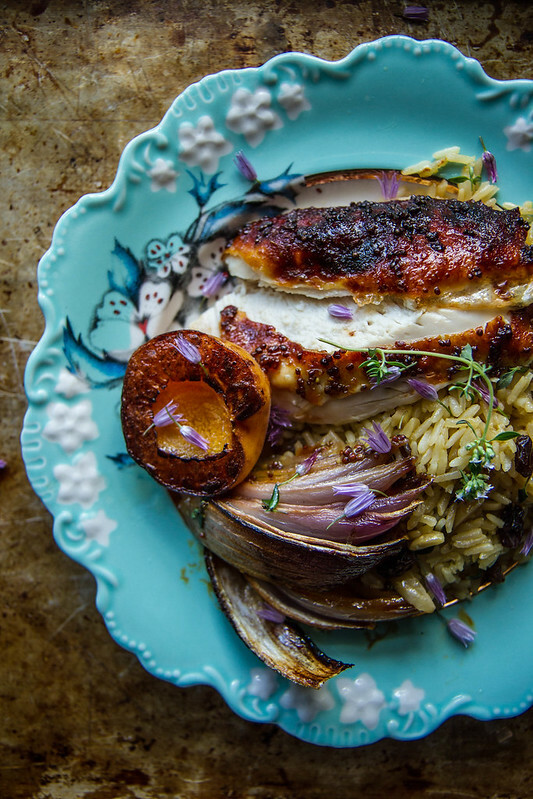 Place the Chicken and the onions in a 9×13 roasting dish. In a small bowl, combine the preserves, mustard, oil and vinegar. Stir well to combine and then pour over the chicken, spreading it evenly. Sprinkle the whole chicken with kosher salt. Bake the chicken at 350 for 90 minutes. At the 60 minute mark, add the apricots to the dish and finish the roasting. Let the chicken rest for about 15 minutes before cutting it into pieces. Serve with the roast onion and apricot. Love the flavours on that roast chicken! I will gladly turn the oven on for this! Amazing! 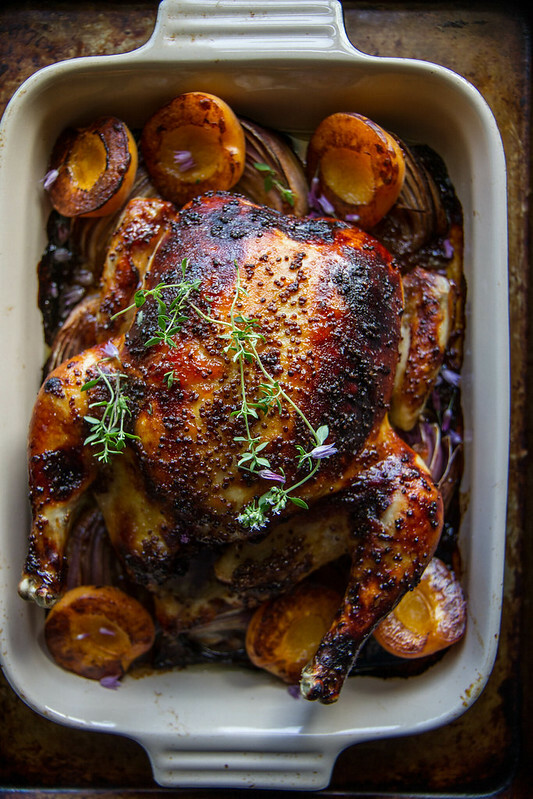 Roasted chicken is always a good idea – and I love yours! Drop dead gorgeous!! Love this!! Oh girl….I can still run on the oven here in the high country. Gonna try this chicken stat! Beautiful!! That chicken looks worth it!! There’s no way this is that simple to make. I could almost smell it just looking at the pictures. This one’s going into the recipes to try file … delicious. Oh this definitely looks worthy of turning on the oven. Really gorgeous and enticing photographs, Heather! I’m seriously salivating! Just sent my hubby out to get the ingredients for this! Thank you, your recipes are always good and delicious. Being able to trust a cook/chef is important! This looks delicious! How did you prepare the rice to serve with it? Hi Claire- it was with onions, chicken broth, raisins and nuts- recipe soon!! Hi Heather, I just wanted to let you know I’ve made this recipe twice now (once with pork chops and once with chicken) and both times this recipe has turned out fabulous! 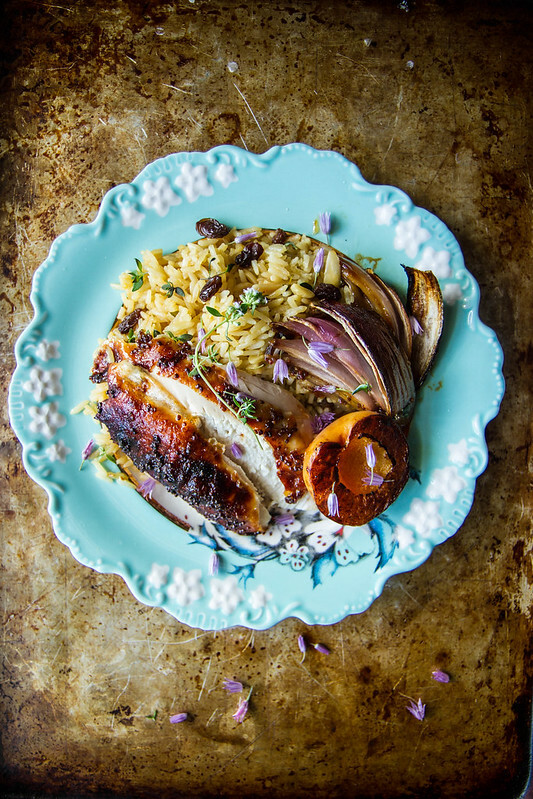 I served it with Golden Basmati Rice (Onion, Garlic, Turmeric, Cumin, Dried Apricots, Raisins, and Shaved Almonds)… Definitely a new dinner favorite. Thank you! would love to have your recipe and measurements for your golden rice. Can you share the rice recipe? I would love to try out this dish but not having the exact ingredients, you gave me ideas I want to try out, hope it works. I would love to hear more and see more. the recepie says 350 degrees. Do you mean celcius? Found your blog and printed out your apricot dijon roast chicken. Sounds great. Is there any way you can enlarge the print when one prints out your recipes. The font is SO VERY small I can barely see it. It says in your post that the mustard is a little spicy. While grain mustard is typically very mild. Did you do a combination of whole grain AND Dijon? So I probably shouldn’t even leave this review as I made so many changes, BUT I did follow the basic outlines. The result was SO delicious. What happened was that after already spending a fortune on other ingredients for my dinner, I was feeling resistant to going back to the store to buy apricot preserves, Dijon mustard, etc. – those little things I didn’t happen to have on hand. What I did have was blackberry jam and honey mustard. I then swapped out the red wine vinegar for balsamic vinegar and butter for the olive oil, and added about 1/2 a teaspoon of chopped fresh rosemary to the glaze (I also stuck one sprig of rosemary in the cavity). I still used the red onion and then prepared the chicken as described in the recipe. It took a full 1 1/2 hours to cook but was super moist and flavorful. I boiled down the juices that came off the chicken for a super delicious gravy. I served it with the roasted red onions and also roasted potatoes. Delish! So, while I didn’t follow the flavor combo here, the basic premise worked beautifully and showed that you can mix and match based on what you have available! WOW! If only I can spell it through my screen…It sounds UNREAL! This recipe was dellcious! I recommend mashed potatoes with this because the gravy was REALLY good! This looks lovely! This is obviously grainy mustard, as the recipe itself says, but the title says Dijon. Did you combine the two? Thanks! Hi Terry- you could use either!I will edit the recipe to reflect that! Thank you Rolinda! it’s a favorite of mine!